In a food rut? My suggestion is to make Zucchini Lasagna, like I did this week. This gluten free plant-based dish is sure to perk up your taste buds. It's a simple-to-follow recipe that's delicious as all get out. 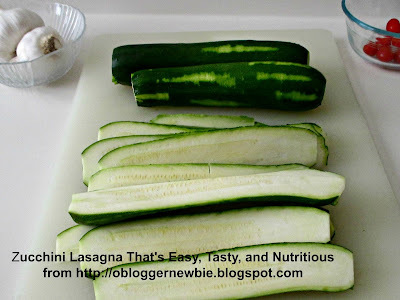 Zucchini is featured in place of lasagna noodles. Tofu, which contains 8 grams of protein in every 3 oz. portion, also contains 15% of the RDA of calcium. What a nutritional punch. No need to puzzle about handling tofu. The secret to making this bland tasting high protein ingredient flavorful is to season it well. Use plenty of spices and herbs that are customary to Italian-style dishes. Your meal mates and you will smile with glee. 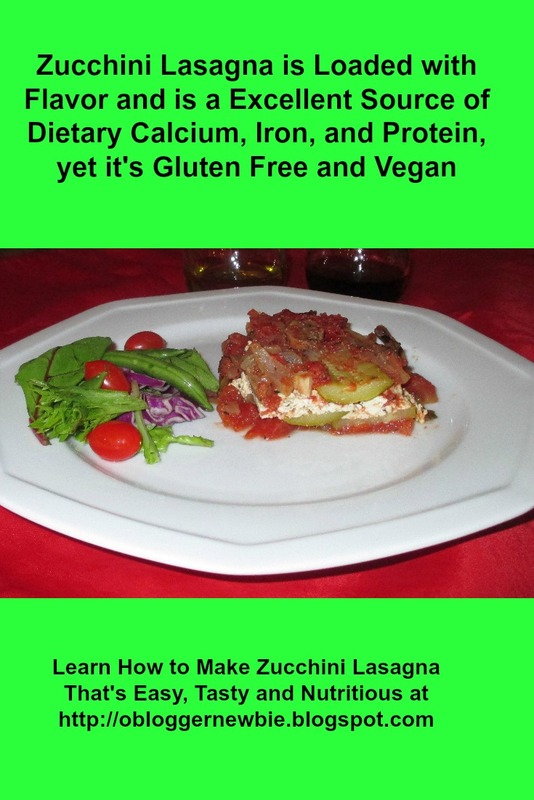 Although Zucchini Lasagna is low-carb, it's hearty and filling. It's the perfect dish to serve on the weekend, either for brunch or dinner. It serves 4-6 generous portions, with leftovers. With no cholesterol and moderate cost to boot (organic tofu is approx. $1.50 lb. ), this entree is healthy and economical. Let it bubble away in the oven, while you read the Sunday paper, watch the game, or prep it a day ahead so the flavors meld. Allow a half hour prep time and an hour cook time. Whenever you decide to cook it, take it from me, it's fun to assemble, cook, and serve. 1 14 oz.-16 oz. container firm or extra firm organic tofu that has been drained. Here's a simple way to drain the water out of a brick of tofu. 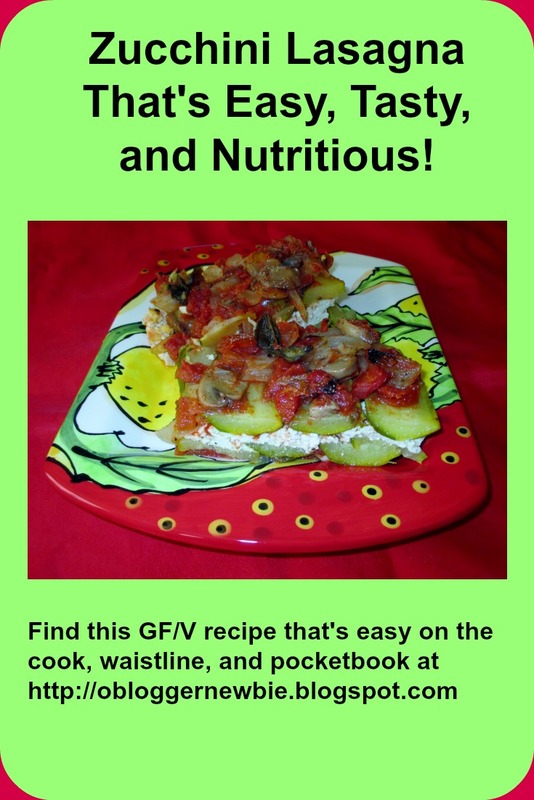 Optional: Adding extra items to the sauce adds depth, increases thickness, nutrients, and calories: 1/2 cup fresh tomatoes, 1-6 oz. 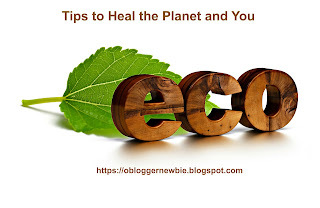 can organic tomato paste, 2 organic chopped carrots, 1 organic red pepper chopped, 1 teaspoon hot pepper flakes, bunch organic parsley chopped, rosemary, and other veggies or seasonings you enjoy. 1. Gather all ingredients including a 13"x9"x2 1/4" baking pan or similar. Preheat oven to 400 degrees Fahrenheit. Mash or chop drained tofu. 2. 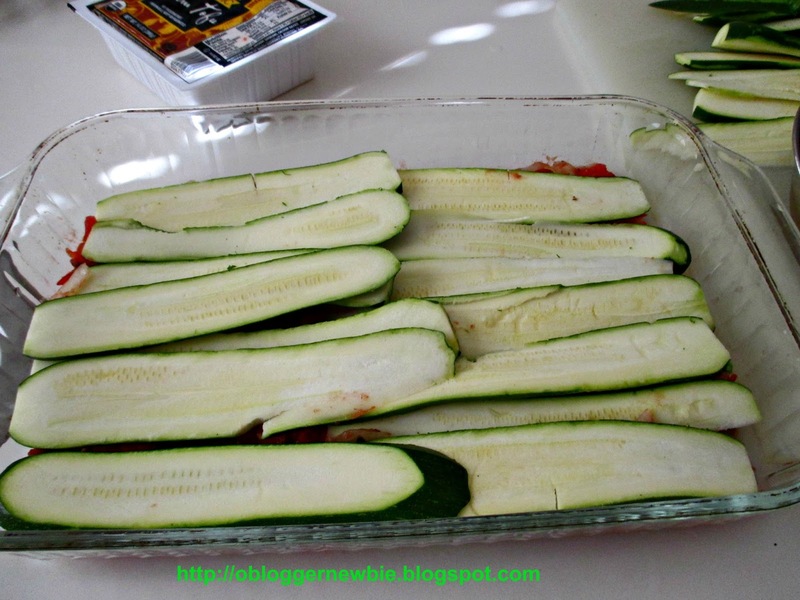 Cut off end pieces of 4 medium organic zucchini and scrape clean. Slice each with a mandolin slicer or by hand. Make pieces about 1/8 " thick. Here's a photo to show you how 2 zucchini look, after they have been scraped clean, and the other two have been sliced thin. 3. Chop onion and grate garlic. 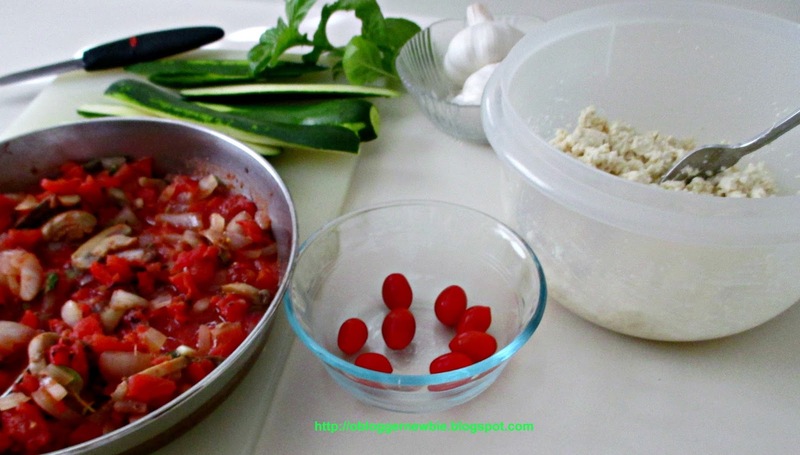 Directions provided in step 2 of this link explains how to grate garlic as well as brown garlic and onion without using oil. After onion and garlic are brown, put half into the tofu. 4. Put ingredients for the sauce (tomatoes, half the onion and garlic, mushrooms, and half the herbs and spices) in the same pot that you used to brown the onion and garlic. Blend them all. Note: I learned from my experience cooking this recipe the first time, to add an optional ingredient, a can of tomato paste to the mix. Two cans of tomatoes make a slightly watery sauce, one that is thinner than I like a sauce to be. I suggest you either pour off some of the juice from the tomatoes (it’s good to save the liquid for soup stock) or add a can of tomato paste to the ingredients above. 5. Spread a layer of tomato sauce on the bottom of the baking dish and put a layer of zucchini over it. 6. Spread the tofu mixture over that. Top with a third layer (zucchini layer). 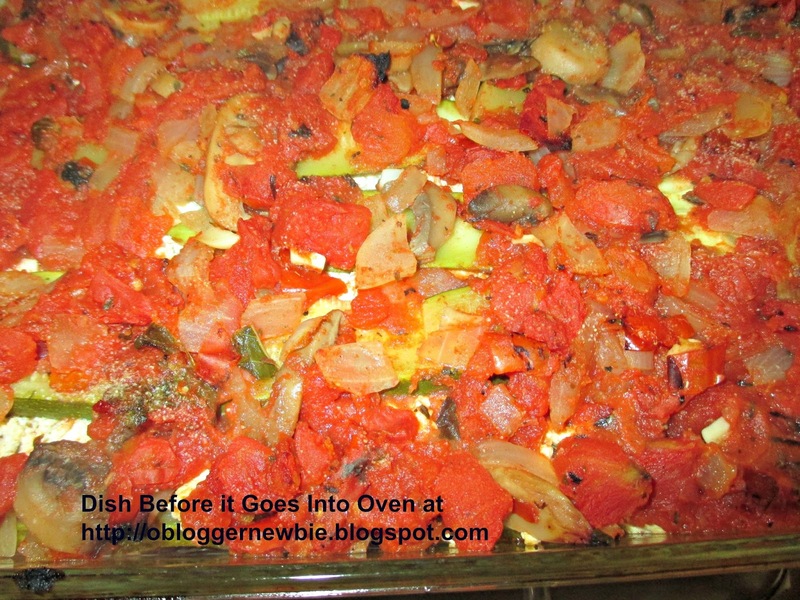 Top zucchini layer with the remaining tomato sauce. Grind on fresh pepper and salt to taste. 7. Cover with aluminum foil and bake in a 400 degree oven for approximately one hour or until zucchini noodles are soft, but not mushy. Test by seeing whether a knife will cut through a piece easily. See how much fun it was to make? Only seven steps and you're done! Please comment below. Do you think you'll make this recipe? Can you offer ideas about other optional veggies that might be good to add? If you like what you see, please share the love. Thanks for the visit, and please come back again. The quote for today comes from Jane Velez-Mitchell. "Cholesterol does not exist in vegetables. Vegetables do not clog arteries."